This is the fifth post of a six-part series that is covering each of the key elements that go into building an engaging and effective website. You can read Part 4: What Does Your Website Need to Do? Building your website is like building a house. WordPress is the foundation and the frame of your virtual house. Your theme encompasses the interior and exterior design—everything you can see and various features like fireplaces and appliances. Plugins are equivalent to furniture, electronics, and things that improve or extend the way your use your house. Your website’s plot of land is its hosting, and its domain name functions as its street address. You need all of these things to have a functional website. Just like there are plots of land that are too rocky or a flood plain, not all website hosts are created equal. You tend to get what you pay for in terms of server speed, stability, and technical support. 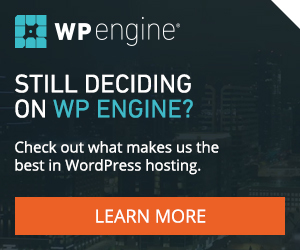 My favorite WordPress host is WP Engine (affiliate link). They’re an Austin-based company that has speedy servers built solely to handle WordPress, free SSL certificates, and excellent customer service. They provide automated, daily backups of your site which is critical and a really really easy way to restore a site if something goes wrong. WP Engine also upgrades your website’s WordPress core after running various tests to ensure that everything is compatible. This is known as managed WordPress hosting. The biggest differences between WP Engine and other managed WordPress hosts, like GoDaddy, are the speed of the servers, the level of control they allow you, and the technical support. If something goes awry with your site or if you’re struggling to implement something, WP Engine’s online support is prompt, professional, and extremely accommodating. They really know how to take care of their users. HostGator, GoDaddy, Bluehost, etc. are notoriously slow and have sub-par customer support. If you do decide to go with one of these providers, do not choose the cheapest plan. Make sure your plan includes an SSL certificate and has a CPanel. A VPS account is much better than shared hosting, but it’s also more expensive. When it comes to where you purchase your domain names, there isn’t much difference between providers. Some are more expensive than others, some have different extensions available, but most are the same. It just depends on which company you want to support with your money. My Domain Name Registrar is Namecheap. I’ve never had any troubles with them, and they often have good promotions. The bottom line here is: make sure you have one. Any computer in between a website and its server (where the website lives) has the potential to steal credit card numbers, usernames and passwords, email addresses, and other sensitive information if it is not encrypted with an SSL certificate. When an SSL certificate is used, the information is unreadable to anyone except the intended recipient. Even if you aren’t selling a product or dealing with extremely sensitive information, you still probably have a web form. Protect those e-mail addresses. Additionally, search engines will see your website as more serious, and you’ll get a slight bump in search results. Most web hosts offer SSL certificates for purchase. Some include them for free, like WP Engine. Just make sure you have one! or download the whole PDF now!